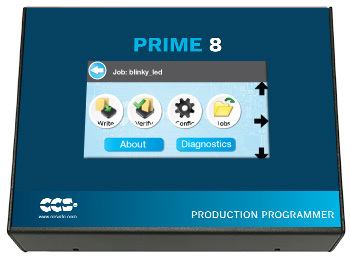 The Prime8 production programmer has eight high-speed ISCP™ jacks for high volume programming. Ideal for production environments, it can operate as a stand-alone production programmer with its USB Flash card reader, or with CCS software on the PC. Program up to 8 devices individually or concurrently. 4.3" Touchscreen LCD user interface to menus and actions when using in standalone mode. Menu in a graphical display for easy icons to read any touch to activate. Aluminum enclosure is a smaller, sleek design and more durable for industrial use. Flash drive readability and faster programming speed. CCSLOAD FREE programmer control software supports the Prime8 and offers many new key features including; powerful command line options in Windows/Linux, extensive diagnostics, easy to use production interface, and enhanced security options. Prime8 can be paired with Tag-Connect, a cost saving production ICSP Programming cable that eliminates the need for a ICSP connector on your product. Tag Connect provides a direct pin-to-circuit connection, saving space on your PCB. The modular end works with existing ICD programmers as well as the Prime8.